PGA - 4 Nights and 4 Rounds. Design your package from over 20 championship courses, and after you're done, use your $100 gift card for beer, food and merchandise at participating courses! DISCLAIMER: Package prices based on quad occupancy in a 2 Bedroom Golf Villa. 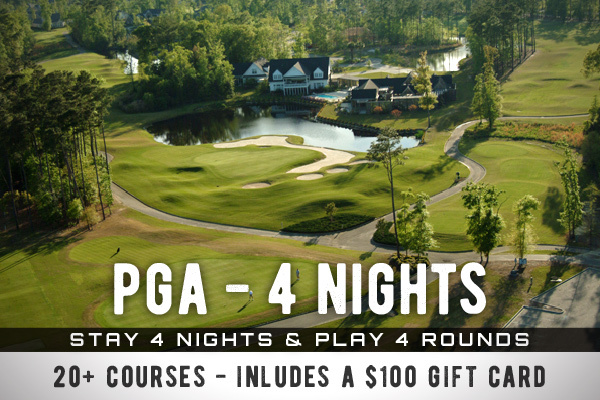 Advertised from rates based on playing Azalea Sands, Brick Landing, Diamond Back & Eagle Nest. Rates vary based on course selection & stay dates. $100 gift card valid for food, beverages, apparel and merchandise at any of the 20+ golf clubhouses (Course list subject to change). Dining voucher to Divine Dining Group is valid for up to $15 credit on food purchase. Valid at Bubba's Fish Shack, Nacho Hippo, Pawley's Raw Bar, Ultimate California Pizza & UCP Game Zone locations only. No cash value. Not valid with any other offer. Offer subject to change without notice.